Two common lawn diseases came into the clinic recently, probably fostered by the cool, wet weather of late in Iowa. Though they are not usually a serious problem, they can be unsightly. They are Ascochyta leaf blight (or spot) and Septoria leaf spot (or tip blight). These diseases are caused by at least 35 different fungal species, each of which can attack one or more varieties of turfgrass, including Kentucky bluegrass and other commonly planted lawn species. A symptom of Ascochyta leaf blight is a uniform bleaching out of small to large patches of lawn, which can develop rapidly (overnight) with high humidity or rainy weather. The disease begins at the leaf tip as small purplish to dark brown lesions, and progresses towards the middle, but does not usually kill the grass crowns or roots. 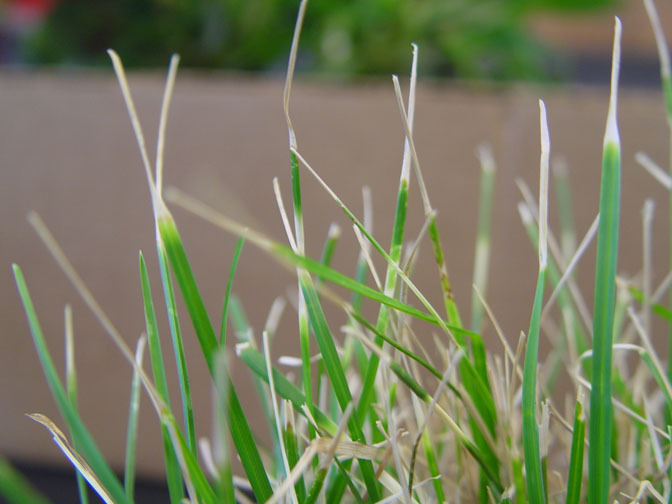 The lesions may coalesce, and the top half of the grass will eventually turn straw-colored and appear pinched just above the healthy lower part of the blade. Green grass is usually found interspersed among the bleached out diseased plants, though the diseased patch appears uniformly straw-colored at a distance. Dark-colored speck-sized fruiting bodies, visible with a hand lens, develop in the straw-colored portions of the leaf, and produce copious numbers of spores that are spread by lawn equipment, shoes, sprinklers, splashing rain, etc. The spores need a wet leaf surface to germinate, and freshly cut, wet grass tips provide a particularly good way for the fungi to invade healthy plants. These fungi survive drought or winter conditions as mycelia (microscopic filamentous body of the fungus) inside, or fruiting structures on tissue of diseased plants or in dead grass tissue in the thatch. Septoria leaf spot has symptoms similar to Ascochyta leaf blight, but begins as gray-green lesions, and the grass does not appear pinched above the green lower blade of a diseased tiller. Also, while cool (60-75 degrees F) wet weather is favorable for both diseases, Septoria leaf spot will not continue to afflict the grass during the heat of summer, but may return with cool wet conditions in autumn. Ascochyta leaf blight may continue throughout the summer under high humidity or otherwise moist conditions. Septoria produces a large number of speck-sized fruiting bodies near the tips of the diseased blades. Both diseases are favored by wet conditions, mowing when the grass is wet, mowing with a dull blade, long grass, thick thatch, and poor nutrition. Fortunately, cultural practices will usually alleviate the conditions favorable to disease development. Avoid mowing when the grass is wet, and mow to the recommended height and frequency with sharp mower blades; when watering is necessary, water deep (to 6 inches) early enough in the day that the grass blades can dry quickly, and avoid watering in late afternoon or evening; keep the lawn healthy by dethatching and aerating when necessary; and fertilize with the recommended regime for your grass in the fall. Use disease-resistant grass varieties that are adapted to Midwest weather conditions, and make sure to provide good drainage when establishing a lawn. Fungicides are seldom warranted for either of these diseases. Links to this article are strongly encouraged, and this article may be republished without further permission if published as written and if credit is given to the author, Horticulture and Home Pest News, and Iowa State University Extension and Outreach. If this article is to be used in any other manner, permission from the author is required. This article was originally published on June 6, 2007. The information contained within may not be the most current and accurate depending on when it is accessed.